PAA Load (pronounced 'payload') class competition was originally sponsored by Pan American Airlines (PAA) in an effort to attract young men into the realm of aviation, in hopes of bolstering its workforce of mechanics, design engineers, loadmasters, maintenance workers, and even administrators. 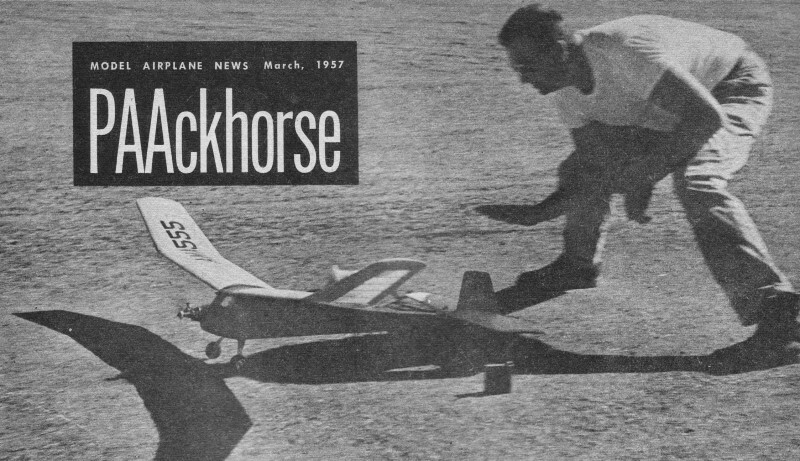 It was similar to the way the U.S. Navy used to sponsor and host the Nationals competition for the Academy of Model Aeronautics (AMA). 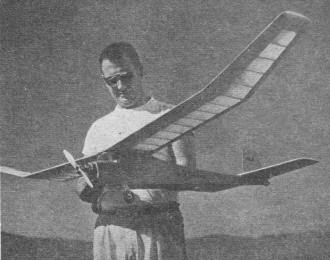 Part of the goal of PAA Load events was to design and fly model airplanes that could carry 'cargo' of a specific size and weight for a certain length of time using an airframe limited to regulation lifting surface area (wing + tail). 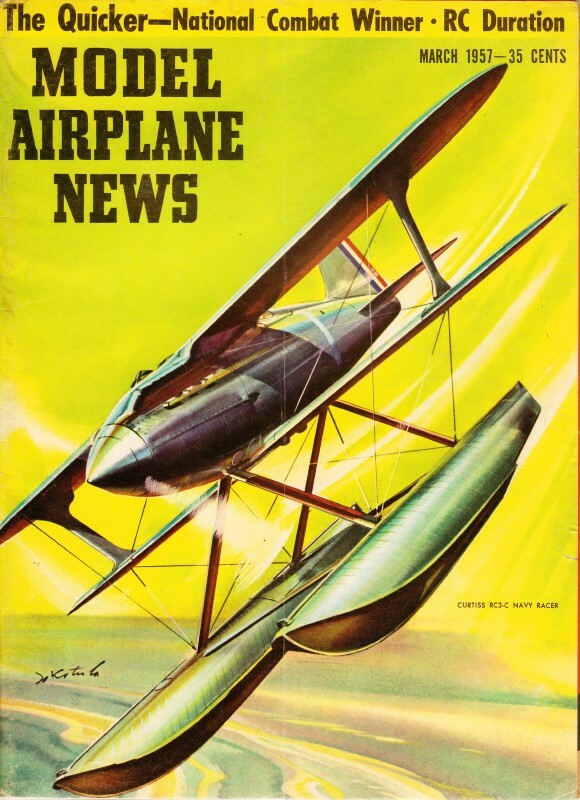 In order to emphasize the relationship to 'real world' aviation, a dummy pilot figure was (and still is) also required (not implying, of course, that real-world pilots are dummies). 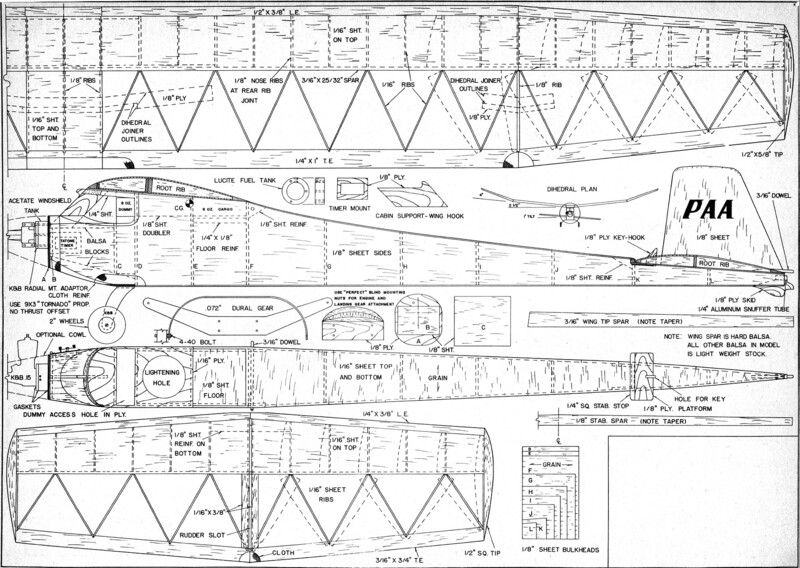 See chapter 14 of the National Free Flight Society rulebook for details on PAA Load competition. For International Class competition in Pan American's PAA Load Event, this superbly designed machine is a joy to build and fly. Stanley Hill releases his PAAckhorse. The PAAckhorse is a ship designed with attention to realism and yet sacrifices none of its performance in achieving semi-scale appearance. A good PAA-load model, like this one, should climb high with it's pound of pay load, and then give up that altitude like a miser. The requirements for a good PAA-load job pretty much set the specifications for the designer. Not being able to go up like a skyrocket with a pound of payload, clean design and a really excellent glide are doubly important. A generous wing of 600 square inches area, high aspect ratio, and an efficient turbulent-flow airfoil, help the PAAckhorse to use the altitude gained as efficiently as possible. 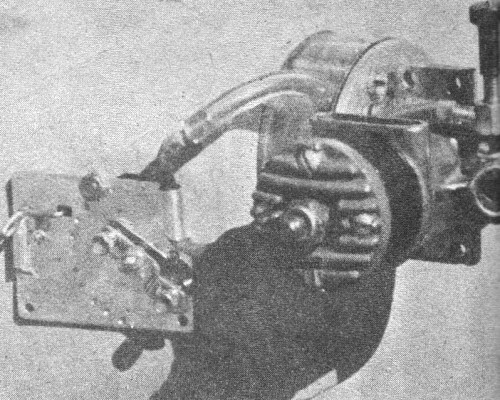 Perhaps second in importance to a PAA loader is a landing gear that will not distort under load and ruin a take-off attempt with a ground loop. The Cessna type gear of sheet dural has proved its merit in handling the weight of RC models and it does equally well at the similar job of getting a heavy PAA-load model "unstuck." Features to note: Cessna type gear guarantees good take-offs; a side-winder engine mounting minimizes exhaust-mess on airplane. Without the pay load, the PAAckhorse will give the contest type free flights a real run for their money. Then try a .19 or .23. As in any contest ship, emphasis has been placed on simplicity and rapid building with perhaps more than the usual attention given to warp resistance. Once built, this one stays put. The "sidewinder" engine mounting used is not necessary, of course, but it does minimize oil collection on the ship, and priming and battery attachment or compression adjustment are easier than in the upright position. Without load or with .19 to .23 engines the model is a potential winner in regular free flight events. 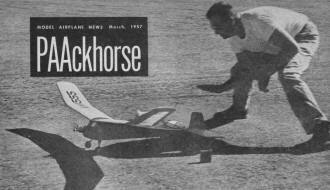 The PAAckhorse differs little from standard practice in construction or flying and presents no problem in either one. Home-made Lucite tank behind the motor mount plate and details of Tatone's timer shown here. Let's build it. 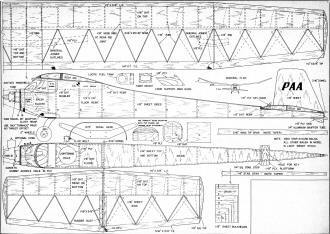 You will note on the plan that all balsa other than the wing spar is of light weight stock. This is necessary to keep the weight of any PAA job down to a reasonable figure. If you must use heavier wood, cut down on sheet thickness on the fuselage sides and leading edges of the wing and stab. Construction is simple enough that we'll mention only the few details that need special note. It's best to build the PAA dummy before the fuselage in order to use it as a guide in fitting bulkheads C and D.
Note that the wing leading edge is sharp and level with the bottom of the wing while the stabilizer leading edge is rounded in the usual manner with its entry point 1/8" above the lower surface. I prefer to use silk covering for its strength. However, Jap tissue and four coats of clear dope is adequate due to the model's structural rigidity and is an ounce or so lighter than silk. The fuel tank is cut from 1/2" Lucite (or laminations of 1/4" using ethylene dichloride cement) with a coping saw, filed and sanded with successively finer grades of sandpaper (2/0, 5/0, 8/0, 400) and then polished with rubbing compound or buffed. Use an extra crankcase gasket between the engine and the radial mount adaptor, a ring gasket between the adaptor and the tank and a full disc gasket between the tank and the firewall. If very high nitro content fuels are used, drain the tank between flights to prevent softening the plastic. For the 8 oz. cargo, a box of 1/8" balsa fitted to the compartment works well. Load the box with BB shot and a little cement to a weight of 8 oz., then cover with silk and dope as the rest of the model. The loss of weight from evaporation of the cement will be made up for by the silk and dope. Flying any PAA loader is far easier than a hot FF job and the PAAckhorse is no exception. 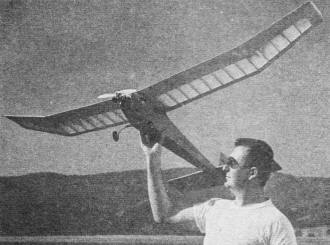 With the load in place and the CG at 3 1/8" from the trailing edge, trim for a flat glide with a gentle right turn by varying stabilizer incidence and position of the whole rudder. There should be no rudder offset, stab tilt being the only offset on the entire ship. The flight pattern will be a straight climb with a smooth transition into a right glide circle. Proper adjustment of the landing gear is essential for good take-offs. Push the model on the ground to see that it "tracks" straight. A slight degree of tow-out is permissible and even recommended but any degree of tow-in will cause a wing to drag on take-off. Don't bother to put the prop on backwards for first tests. In fact, nearly full power is OK right from the start. The PAAckhorse performance on the allowed 20 sec. engine run should give you a better than ever chance of bringing home some of PAA's prizes.